Unfortunately, the statue had already been vandalised by August of the same year, and the spot had been 'permitted to be used as a playground by dirty and squalid children'. Since then it has undergone various tribulations, including in 1994 damage by a drunken visitor climbing on it and bending the figure. Since then, it was renovated and put back, as one of the most familiar sculptural emblems of London. 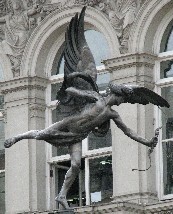 The actual figure of Eros is very art nouveau, a slender winged youth, unclad except for the swirling drape that provides the modest covering deemed suitable for a male statue in such a prominent site, leaning forward and firing his arrow of love downwards, as if to inspire romance in the hearts of some random selection from the unsuspecting tourists below. (This website incudes a page on allegorical statues of Love.) 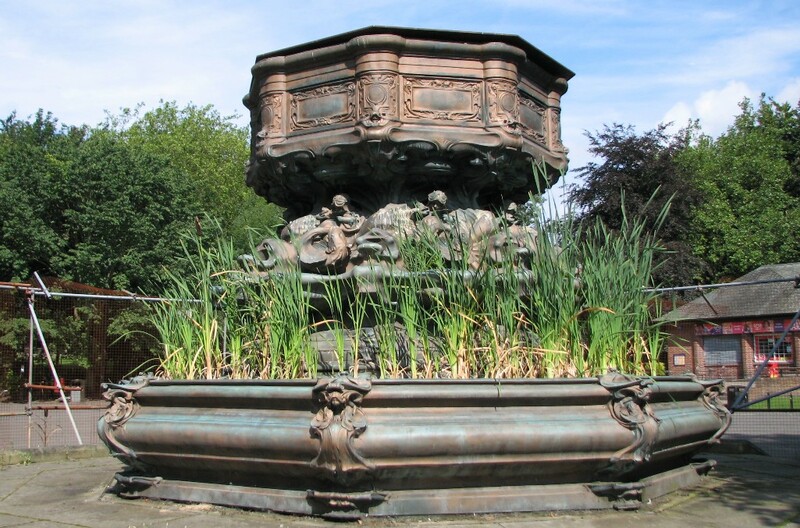 There is a second version of the Eros fountain, in Liverpool, in Sefton Park. When I saw it, the actual statue was in the Liverpool Conservation Centre, and the fountain in the park was a lonely, overgrown thing, both evocative and sad to those who are used to the busy scene round the version in Piccadilly Circus. 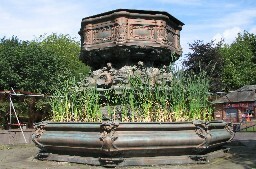 The Eros fountain in Sefton Park. 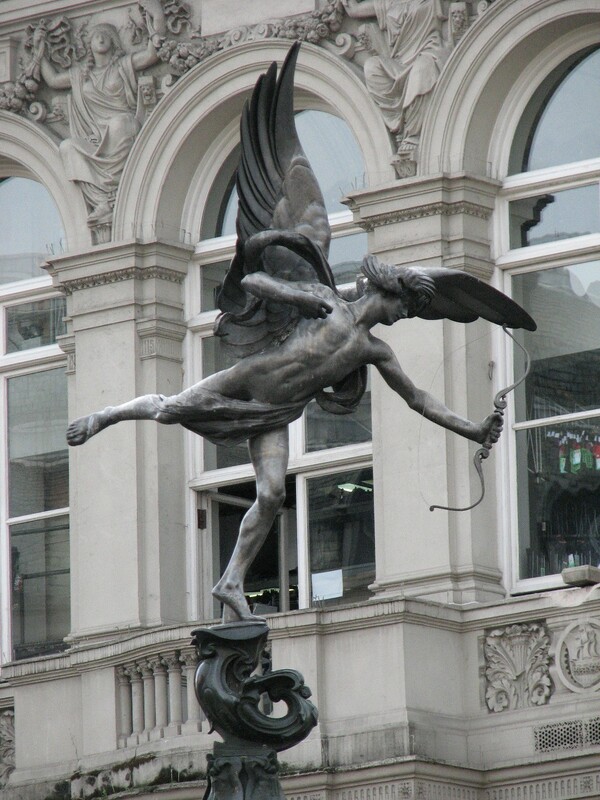 More pictures and information on the Statue of Eros on this page. There is other sculpture in Piccadilly Circus. The backdrop to the Eros is the Criterion Theatre building, today housing Lillywhites too, a flowery classical facade, with four full statues in niches at first floor height, and above the high second floor, a frieze with two further female figures in spandrels between the arched tops of the windows, flanked by small angels, all in alto relievo, and the surface of the building bears a variety of other wreaths, hangings, panels and little friezes. The four figures, all female, form two pairs, facing inwards to the centre. The outernmost pair are draped, the inner pair semidraped, and all are lively and original in treatment. The lefternmost figure, as we look at the building, is perhaps the best - she uses her arm to pull her cape around herself, and cape, drapes and her long hair blow in the wind. All rather Pre-Raphaelite. Next, a semidraped beauty with a small drape held above her head, echoing the first figure, but with a lovely oval composition based on the line of her arm, the drape, down her other arm and and sweeping back to the left with the top of her skirt, pulled forward to hold a garland. Carrying on to the right, the inner girl, again semi-draped, rests one elbow on a treestump, the other holding some obscure thing on her head. And the rightmost figure, a more chaste girl, and the only one with short hair, holding a cornucopia and a long staff covered in vines. Indeed, all four have foliage around them, and we can spot oakleaves, ferns and bullrushes and corn. But as so often with such works, no signature of who made these elegant works. By contrast, up where they cannot be examined closely, are the ridiculous spandrel figures, with rudely chiselled faces that one can only think are some modern replacement of something deteriorated. And the corner spandrel angels are weird little naked things, crude and unfinished. What a contrast to the decayed but still characterful snarling lion faces on the adjacent Corinthian capitals. The architect of this building, working at the beginning of the 1870s, was Thomas Verity, and the sculptor at least of the four figures is Edward W. Wyon. Figure on the Criterion Theatre building, behind Eros . Standing by Eros , we can see the satisfying sweep of Regent Street, and nearest to us, the Alliance Life Office, with at the very top a suitably bulky Britannia and Lion, a workmanlike, solid figure in stone, rather more towards Deco than Victorian sculpture. This site includes pages on both Britannia statues and Lion sculptures. From Piccadilly Circus, the opposite direction to Piccadilly leads naturally into Leicester Square, or one can walk southwards along Lower Regent Street to the statues in Waterloo Place, or southwards and eastwards to Trafalgar Square, or follow a sculpture walk along Piccadilly.